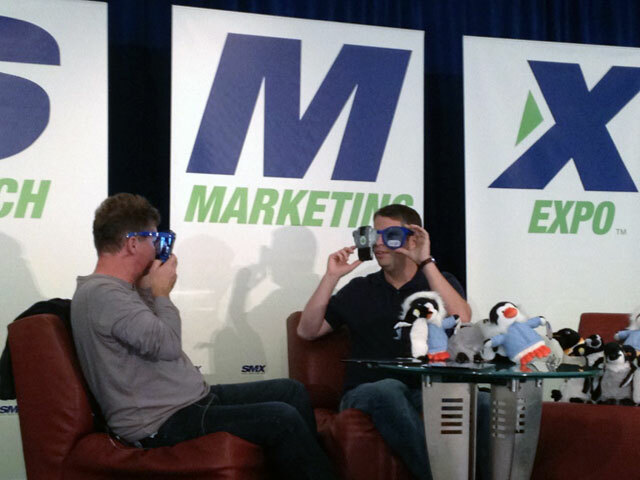 Last night at SMX Advanced Google's Matt Cutts and Search Engine Land's Danny Sullivan pulled out their Google Glasses. Yea, they tapped an Android phone on huge sunglasses as a joke. Also notice the Penguins and Pandas around them. The back story on the glasses is that Danny lost his Android phone right before the session but Matt didn't. Matt had tapped the Android phone to those glasses as a joke. Oh, and I was lucky enough to walk away with a Penguin. See my full coverage of the panel over here - with lots of pictures.